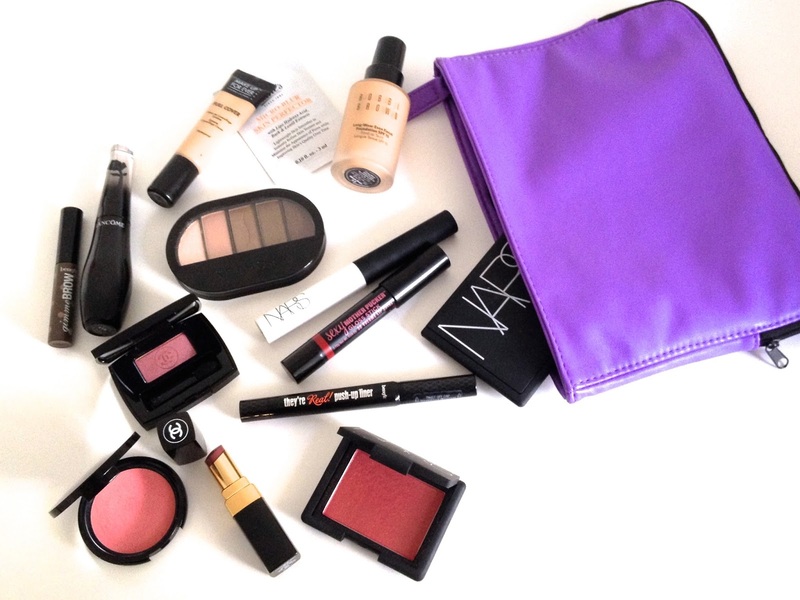 "My current makeup bag is a gorgeous purple Sephora one. It's quite small, but you can still fit a lot in there and the products will sit nice and tidy as it's so slim. You can also use the stickers that come with it to personalize it, but I haven't got round to doing it yet! At the moment I’m trying out the Micro-Blur from Kiehl’s, so I’m using primer every day. It doesn’t usually happen, but I have to say I’m loving it! It’s fairly similar to Benefit Porefessional at first sight, but it’s a more creamy version that still fills in pores and mattyfies the skin while treating it at the same time. My current foundation is the Long-Wear Even Finish from Bobbi Brown I bought in august in Barcelona. It’s amazing as it just looks like skin. Perfect skin, but still! It lasts incredibly well even without powder staying true to its longevity claims, and the shade 3.5 is the best match I’ve ever found. Concealer wise I’m faithful to my Full Cover from Make Up Forever, as it covers everything without looking cakey (the key is to tap it on with finger tips and then layer if needed) and it’s so long lasting. My powder of choice is still the MAC Blot Powder, as I love how it keeps every foundation in place until I want to take it off without looking powdery at all. I truly recommend it! The thing that I’ve been wearing on my eyes without fail for the last three months is the They’re Real Push-Up Liner from Benefit. I’ve been wearing it at least five times a week, but that number is slowly moving to 7/7. It’s the easiest liner I’ve ever used, its mat black shade is gorgeous and looks great on its own too. When I have the time to play with eyeshadows I’ve been using - over my HG eye primer, the NARS Pro Prime - either this palette from Sephora called Pale To Rich Taupe, or the Chanel Ombre Essentielle in Hésitation. The first option is a great natural daytime appropriate palette - if you skip the first shade that is awfully glittery - that can be smoked out with the mat dark brown for a more intense look. The Chanel eyeshadow is a gorgeous pink plum that compliments the green component in my eyes perfectly and screams autumn to me. The mascara I’m using at the moment is this breathtaking one from Lancôme, called Grandiôse. Its innovative shape makes applying it a breeze, but what really makes it stand out to me is the brush. Paired with the great formula makes my lashes volumized, curled, defined… Everything I could ask for! On my cheeks I’ve been alternating between cream and powder formulas. I’ve been wearing Make Up For Ever HD Blush in #330 Rosy Plum a lot, which is unheard of from me as it’s a cream blush. It lasts for ages and it’s glowy without being too dewy, and the shade is simply gorgeous. The powder one that has barely left my cheeks is NARS Outlaw. A dark pink plum with the most gorgeous shimmer running through, requires a light hand and a good brush, but the effect it gives is so worth it! A little bit of NARS Laguna is sometimes applied just before the blush, but I’ve been skipping it most days and actually enjoying the different look. The lipsticks that I’ve been wearing most are all sheer balmy formulas. Dior Addict Lip Glow gives the lips a gorgeous pink color that can be built up to look nearly like a hot pink on me, with the shine of a lipgloss with the comfort of a balm. Soap & Glory Mother Pucker Gloss Stick in Plum Jam is a burgundy plum that is incredibly smoothing and hydrating on the lips, and it’s what I’ve been wearing most days. Finally Chanel Rouge Coco Shine in Confident has been my luxury treat with its gorgeous plummy pink shade and great formula. Here’s what’s been sitting in my current makeup bag. These products make for a great early autumn look while still standing the last days of heat amazingly well. And thank you for having me Maia! It was great to blog for your readers, I can't wait to read your comments!" Isn't she so cute? I also did a post over on her blog, so why not check that out too? Gyudy, thank you, this collab was so fun! I'm sorry it's take me so long to come over and check your bag out Gyudy - of course it's chock full of goodies! I'm swatch I g Chanel's Hesitation next time I'm in store for sure. Picked up a few of my first Chanel lippies recently and I feel a mild obsession coming on! And thanks for introducing me to Maia! Best High Street Moisturiser? Vote for Nivea. The Simplest Skincare Routine Ever?